Admittedly, this spider was not in my apartment. This spider was at my work, which is just down the road from my apartment. (We were having a serious spider problem last summer.) I named her Yellow because the first time I saw her out of the corner of my eye, I jumped back, and yelled, “YELLO.” You know, like hello, but surprised… And she was yellow… I’m creative. After that day for at least two weeks I ran when I rounded that corner, hoping to God she didn’t fall on me or jump at me and eat my eyes. I would have avoided it all together, but it was the only way to get to my car. After another week of lightly jogging by, I noticed that she hadn’t moved once since the first time I saw her, so I assumed she was dead. I was correct, and it was only at that point that I felt brave enough to take a picture. 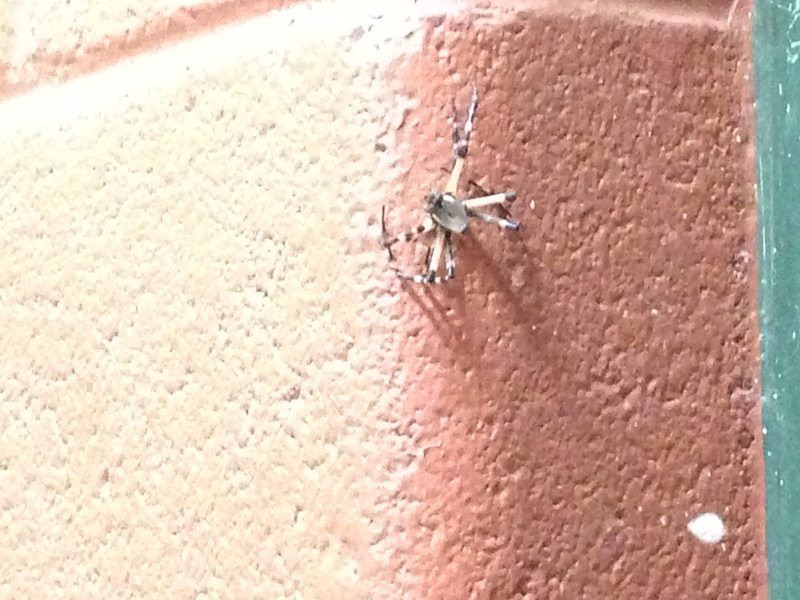 I don’t have a picture of this, but I had another, decidedly more horrifying, spider experience at work. I was walking to my car one night, and I passed by one of our golf carts that we leave by the loading dock. I thought I saw something moving on it, so I looked and I saw that a spider had made a web on it. I made a face and started to turn away when I saw ANOTHER spider and web at another place on the cart. I stepped back and really looked at the golf cart and realized it was absolutely COVERED with spiders and webs. They were all a darkish brown, had round bodies about the size of a dime, and had medium spindly legs. I stopped counting at 23 spiders, but there were more. One had a web in the steering wheel, several were on the back opening, several had made webs from the dashboard to the seat, some made webs around the gas and brake pedals….. It was like a nightmare. I could not make this stuff up if I tried, because I absolutely would not want to. I wanted to leave a big note on the cart warning the person who would use it in the morning to look carefully, but I didn’t have anything to write with. Also, I just wanted to run the hell away. I really hope they were not devoured by the spider herd, but I can’t be sure.